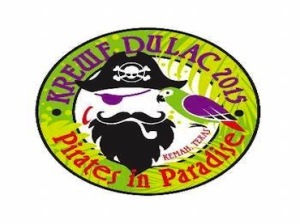 Krewe Du Lac, the official krewe of Kemah, is making some changes in 2015 with Captains John and D’Anne Conrad at the helm of the pirate-themed krewe. “Pirates in Paradise” is the perfect theme for this year as pirates once were known to comb the local shores. Krewe Du Lac celebrates Mardi Gras as a non-profit organization that promotes the cultural, educational and traditional customs of Mardi Gras while providing information, guidance and activities for all. The krewe plans to begin the Mardi Gras season by cruising into Kemah for the King’s Cake Party, Sunday, Jan. 4, at T-Bone Tom’s. “Make plans to become a member of the krewe and join the events that conclude with the Fat Tuesday Parade in Galveston Feb. 17,” the Conrads suggest. “So, grab your pirate or Mardi Gras attire and make this Mardi Gras season a little more special for you and those around you by joining the fun,” D’Anne adds. A complete list of events is listed below. Contact www.krewedulac.org or marmskool@aol.com or 281-382-1435 for tickets or questions.